A pair of NASA spacecraft is getting set to orbit the moon this weekend, a move that will kick off the probes' effort to study Earth's nearest neighbor from crust to core. 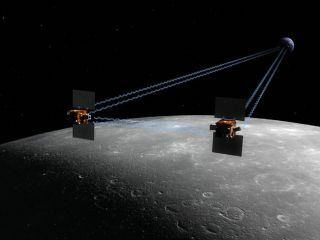 NASA's twin Grail spacecraft are slated to start circling the moon one day apart, with Grail-A arriving on Saturday (Dec. 31) and Grail-B following on Sunday (Jan. 1). The two probes will then fly around the moon in tandem, mapping the lunar gravity field in unprecedented detail and helping scientists better understand how the moon formed and evolved. "This mission will rewrite the textbooks on the evolution of the moon," Grail principal investigator Maria Zuber, of the Massachusetts Institute of Technology, said in a statement. The $496 million Grail mission (short for Gravity Recovery And Interior Laboratory) launched on Sept. 10 from Florida's Cape Canaveral Air Force Station. The two washing-machine-size probes have taken their sweet time since, charting circuitous, energy-efficient courses that will get them to the moon after more than three months of flying. Contrast that with NASA's manned Apollo 11 mission, which prioritized speed and got there in three days back in 1969. Grail-A and Grail-B won't be ready to start their science campaign immediately upon arriving at the moon. Rather, they'll spend another two months circling lower and lower, eventually settling into orbits just 34 miles (55 kilometers) above the lunar surface, researchers said. Regional differences in the moon's gravitational field will cause the two spacecraft to speed up or slow down slightly, changing the distance between them as they fly. Using microwave signals that they bounce back and forth to each other, Grail-A and Grail-B will gauge these distance variations constantly. And they'll do so with incredible precision. The Grail probes will be able to determine how far apart they are from each other to within a few microns — less than the width of a human red blood cell, researchers have said. The Grail team will use the twin probes' measurements to construct highly detailed maps of the lunar gravity field. These maps should help scientists plan out future lunar landings, of both robotic and manned spacecraft, officials have said. And the mission's observations should yield other benefits as well. Specifically, Grail's data should reveal the moon's structure in great detail, allowing scientists to draw insights about how the rocky body formed and how it has changed over time. "Grail is a journey to the center of the moon," Zuber told reporters Wednesday (Dec. 28). The two probes' measurements, along with data collected by other spacecraft, she added, "will enable us to reconstruct the moon's early evolution." This information, in turn, could shed light on how other large objects in the inner solar system came to be, researchers have said. Grail's primary science work should wrap up in June. But the Grail team hopes NASA grants the two spacecraft a mission extension through next December, Zuber said. She and her colleagues want to take Grail even lower, to just 15 miles (25 km) or so above the lunar surface. "I call it flying over the treetops of the moon," Zuber said of the proposed extended mission. "We will take the spacecraft down as low as we can, to map, have a sensitivity to the shallowest, shallowest structures of the lunar crust." Researchers also want Grail to raise public awareness about the moon, and to help engage kids in math and science. To this end, special cameras aboard the probes will be used to encourage middle school students to participate in lunar research and follow along with Grail, during both its nominal mission and any extended campaign. The so-called MoonKam project, which will snap photos of the lunar surface for students on Earth, is led by former NASA astronaut Sally Ride and her educational company Sally Ride Science.